For testing Paco Kelly's Acu'rzr I used three different brands of .22 long rifle ammo in my Marlin Papoose. 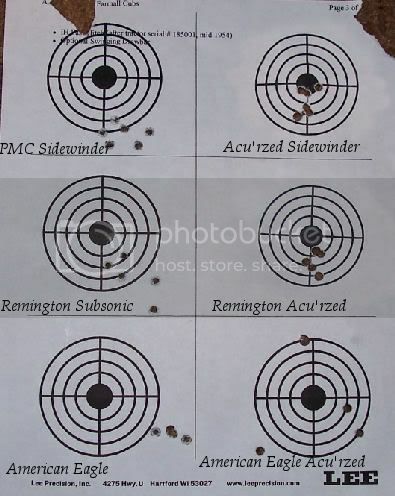 Remington Subsonic, American Eagle, and PMC Sidewinder. There are good articles that have already been published by Jeff Quinn on this great little tool so I will just go over the basics. 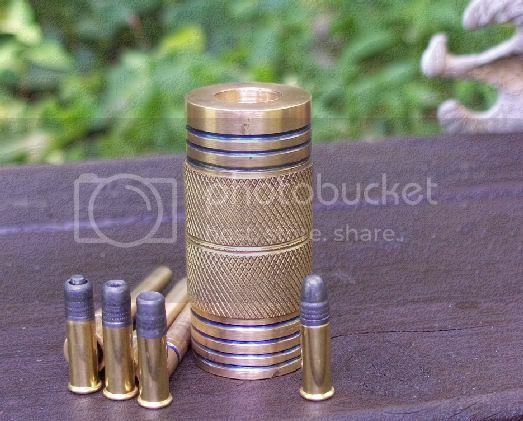 For more detailed information about and how how to use this high quality tool and many more products you can visit Gunblast.com the online gun magazine. The Acu'rzr I will be using is the deluxe model with all three forming rods. The Acu'rzr is a tool for resizing, and reforming the noses of .22 rimfire ammo and is made by a fine gentleman and friend named Paco Kelly of Tuscon Arizona. The tool body is made from high quality copper rod and has three forming rods which are used to resize and reform the nose of the bullet. There are two ends to the tool body with a different size on each end. 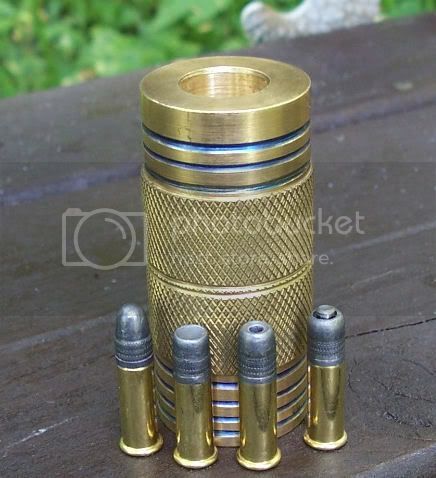 The one I have is .223 diameter on one end of the tool and .224 on the other, you can also have one custom made to your chamber size. Not only does this tool resize and reform the nose of .22 caliber rimfire ammo but it makes the ammo more accurate! Pictured is the acu'rzr with all three forming rods with reformed and accurized ammo. Of the three forming rods one makes a cupped point which used for accuracy and cuts clean holes in paper targets. The second forming rod is for the nasti nose, a cupped deep hollow point that dumps all it's energy into the target. The third rod is for the scorp'n nose, which is a post inside the cupped point. Pictured are the PMC sidewinders, one with the standard factory nose and the others reformed using the Acu'rzr. 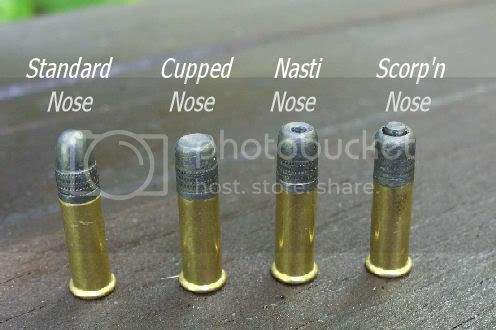 You can see the difference between the standard factory American Eagle hollow point and the NastiNose. BIG difference! 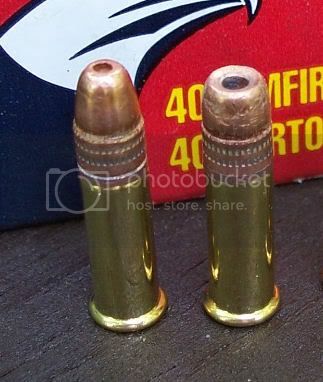 I first tried resizing the American Eagle ammo in the .224 diameter end of the tool and the results where not that great and they actually worked better without resizing . I had problems with the American Eagle feeding and cycling as well. Once I started resizing the ammo to .223 diameter my groups tightened considerably! All shots were taken at 30 Yards. For the test I used the cupped nose and as you can see the clean cut holes in the paper and the tightened groups.The bottom line is this thing works! This tool has definatly made my Marlin Papoose a tighter shooting rifle.